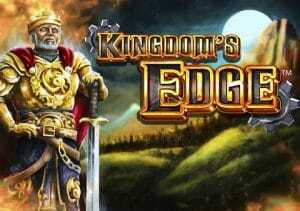 Join the dwarves, magicians and warriors in the ranks of King Trenin DeSaxe’s army in Kingdom’s Edge. Created by NextGen Gaming, this highly volatile fantasy epic is played using a 5 reel, 20 payline game engine and comes with stacked and expanding wilds, multipliers and a bonus feature that awards infinite free spins. Play on your computer, tablet or mobile from between 10p and £200 per spin. There’s a medieval fantasy style to the design in Kingdom’s Edge. A hilltop castle forms the backdrop to the reels which are made up of stylised A to 9 playing cards and a selection of the king’s army. They include Giant Knight Omin Preesh, the rebellious Queen of Arrows Liliana Strait, virtuous dwarf Holta “Silver” Mett and the mysterious Keeper of the Magic Resmina-Mi. Look out for the king who is the wild as he is central to the game’s 2 features. Rally the Troops feature – filling the whole of reel 1 with a stacked gold king wild triggers this feature. Any silver wilds elsewhere on the reels will expand and turn the whole of that reel wild. These silver wilds can also boost multipliers up to 5x as well as adding extra spins. Trigger this and you’re guaranteed a win. Defend the Gates Free Games feature – land 3, 4 or 5 of the shield scatter on the same spin and you’ll be awarded 15, 20 or 25 free spins. If any part of a gold wild lands, it expands to fill the whole of the reel. Hope to see gold wilds land fully stacked as they will get you another 10 free spins. These re-triggers can hit multiple times. The Rally the Troops feature applies here meaning you can get a multiplier up to 5x on each free spin. NextGen Gaming has obviously put plenty of thought into the back story of this video slot which should appeal to fans of the sword and sorcery genre. Even if you’re not usually a fan, the features offer enough to make it worth a look, especially if you like volatile action. This is an extremely high variance game with potential payouts of 3,000 times your total bet on every spin. Expect some lengthy winless runs. You can win big on a single spin here though. The design here is rather good too. The comic book visuals and orchestral score combine to excellent effect. If you’re a lover of daring, medieval adventure or video slots that deliver plenty of volatility, then it’s worth taking a trip to the Kingdom’s Edge. I also recommend you try WMS’ Black Knight II and Microgaming’s Forbidden Throne which has similar themes and are high variance.